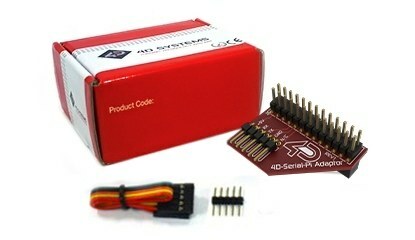 4D Raspberry Pi Adapter Shield lets that you can use 4D Systems branded display modules with your Raspberry Pi. You can use this shield instead of external jumper cables for adding a display to your Raspberry Pi in a very practical way. If you have display modules which are compatible with Arduino and Raspberry Pi, you need to buy this shield adapter. This board is already available in 4D Systems branded touch display kits. d(products that their model numbers are ending with PI , for example SK-28PTU-PI).